Not long ago (I mean weeks) I was in a rented car (that is, my love drove and i sat next to her, because I don’t have a driver’s license) and I forgot to take a CD with me. And listening to music in cars is one of the dear pleasures in life, so when we stopped to do some shopping, I looked around for a nice digital score for the rest of the trip. I had to by some paint brushes, which I usually buy at Action, one of the cheapest warehouses in Holland. Much of what they sell dies before you have left the shop, but they also sell some good stuff. Like the paint brushes. While standing in line to get rid of my money, I noticed a little CD stand. They sold four CD boxes, all with four CD’s in it. The design and the titles were not promising much: Blues Hits, The Sixties, Love Songs and a title that I cannot remember. But the price was only 2,50 euro, which is cheaper than the price of four empty CDr’s. I carefully read the song titles and the names of the artists on the boxes, fully realised that I was not buying what this information supposed to tell, and bought the box with Love Songs. For the price of one-and-a-half paint brush! In the car I told our children to be quiet for a few minutes, so I could check out my new CD’s. I don’t think you can read the titles on the scans that I made, so I will list up some of the songs on the CD’s that I was looking forward to: I know by Ike & Tina Turner, Like to get to know you by Spanky & Our Gang, Will you still love me tomorrow by The Shirelles and many Mersey beat hits by bands like Gary & The Pacemakers and Herman’s Hermits.|I would never play this music at home, but it seemed a perfect soundtrack for a car ride. Not! In stead of the promised I know by Ike & Tina Turner the first CD opened with Goodbye my love by a band that sounded a bit like The Hollies. But this was clearly not recorded in the sixties, but at least 20 years later. 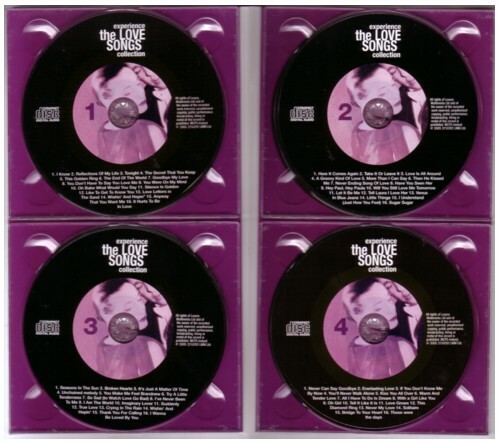 And the rest of the material on this four CD’s was equally wrong: later recordings by the original band, later recordings by the original band but with different band members, later recordings by different bands and last but not least: live recordings by the original singers, decades after their hit, on obscure stages with obscure backing bands. But there were also some original recordings on the CD’s: recorded from scratchy vinyl, without doing any effort to remove the ticks and surface noise. Man, what I day I had! I love to listen to music that makes me think. How is it done? What is good/wrong about a song? How can good songs sound wrong? How can wrong songs sound good? What was the artist thinking while she/he recorded the song? Well, I should have bought all four CD- boxes, because this is the stuff that gives endless insights in the music industry. I will spare you all my thoughts on this subjects. But here is one thing that came to my mind while listening to these CD’s and that I do want to share with you. One of the things that fascinates me to no end is the magic of songs. Even songs that I don’t like, have magic: the fact that I don’t hear a singer or a drummer, but a song as a thing in itself is magic. This magic is easier to describe for literature: when we read a text we don’t see separate letters, or not even separate words, we take in meaning. It is still a complete mystery how this works. When we read, we don’t really look at what we see. Sometimes we do, and that is when we “can’t get into it” . It is the same with music: we are so used to getting into music that we almost take it for granted. But when you listen to four CD’s with songs where’s something wrong with, you realise that the magic in pop songs is not obvious. Especially the studio recordings of hits, that the original bands/artists made 15 or 20 years after the original recording, are fascinating. It is the same song and the same singer, but the result is totally different. The magic is missing! It would be easy to illustrate this story with a track by somebody who has spend the years in between the recording of his hit and the recording of the track that ended up on one of the four CD’s that I bought, with drugs and alcohol. It is clear that this is doing no good to the magic. Les Gray, the lead singe of my favourite band Mud, is a guy who did this. After having some truly magical moments caught on vinyl in the mid seventies, he drank himself to death. He was on stage and in studios till the very end (around 200), and the results are so painful that I cannot listen to it without crying. There is one such track on one of these CD’s, but I don’t want to let you hear that. Some artists just ran out of luck after their hit(s). It must be hard to have a lot of success and to make a lot of money for a while, and than to have to make a living as a house painter or bus driver. But some people deal better with bad luck than others. On these CD’s are a few singers that managed to preserve some of their magic after their succes was over. Not all of it, and most often the backing music is lacking all the magic that was in the original hit version, but nevertheless: I get emotional when I hear an old voice try to reproduce some of the magical qualities that it’s younger version had. Here is an example, by a band that is very dear to me, playing a song that is also very dear to me. The band is The Tramps and the song is You make me feel brandnew . As you probably know this was a hit by The Stylistics in the mid-seventies. It was supposed to be a sad song, but man, this eighties or nineties version by The Tramps makes me really sad. And for the wrong reasons! I remember buying a CD from the Stones on the Nieuwendijk that looked quite original, when I played it at home you could hear the needle being put down on on the scratchy record they ripped it off… I never went back to get my money back because I thought it was kinda funny to have a CD that sounds like a record.